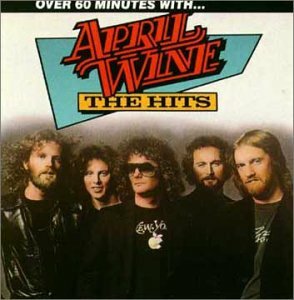 April Wine were successful in their native Canada for a decade before breaking through in the US. Just Between You And Me was their biggest hit in the US in 1981. April Wine formed in Halifax in 1969 but they moved to Montreal in 1970. Myles Goodwyn was lead singer, guitarist and main songwriter. Other members were David Henman on guitar, his brother Richie Henman on drums and cousin Jim Henman on bass. Shortly after moving to Montreal, April Wine signed with Aquarius Records and their debut album April Wine was released in 1971. The single Fast Train got some airplay on Canadian radio. Jim Henman left and was replaced by Jim Clench of Coven. For their 1972 album On Record, April Wine signed a US record deal with the Atlantic Records label Big Tree Records. The first single was a cover of Hot Chocolate's You Could Have Been A Lady. 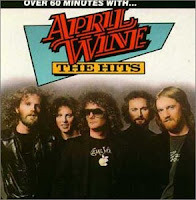 It reached #2 on the Canadian charts but April Wine never seemed to get anywhere in the US with Big Tree. On Record was certified Gold in Canada. Then the Henman brothers left and were replaced by former Mashmakhan drummer Jerry Mercer and guitarist Gary Moffet. Aquarius suggested Moffet and April Wine producer Ralph Murphy also produced Mashmakhan. They continued to have success in Canada. After the 1975 album Stand Back, Clench was replaced by former Mashmakhan guitarist Steve Lang. Clench would go on to replace Randy Bachman in BTO and he was an original member of Loverboy. Then April Wine got a big break. They played a 1977 charity gig at the El Mocambo in Toronto headlined by The Rolling Stones. This got them a new US record deal with Capitol and a chance to tour in the US. Then they added guitarist Brian Greenway also from Mashmakhan. Greenway was an accomplished singer and songwriter and his addition allowed Goodwyn to switch to keyboards. April Wine continued to have success in Canada and they finally had success in the US when the 1981 album Nature of the Beast was certified Platinum. Just Between You And Me reached #21 on the Billboard Hot 100. Supposedly it was the first Canadian video played on MTV. Things started to fall apart for April Wine when Goodwyn moved to the Bahamas and started working in a solo album. The band fell apart but Goodwyn and Greenway recorded one last April Wine album with session musicians. Capitol has released the budget comp Classic Masters but it doesn't have any of the Big Tree material on it. This comp is a more expensive import but it includes April Wine's early recordings. April Wine reunited in 1992 and Goodwyn and Greenway continue to lead them today. Jim Clench died in 2010. April Wine were inducted into the Canadian Music Hall Of Fame in 2010. Here's the video for Just Between You And Me by April Wine.